The Yew tree has become one of my favourite species of Bonsai to work upon. This is mainly due to the ease of styling and the dramatic contrast between the lush green of the foliage and the beautiful reddish bark that they purvey. TAXUS ‘baccata’ – “English Yew” – green leaves lighter in colour to its Japanese counterpart. TAXUS ‘cuspidata’ – “Japanese Yew” – dark green leaves with light green undersides. Both trees can bare fruit with a red aril. There are also many cultivars off these two main species, such as the variegated variety TAXUS baccatta ‘Fastigiata Aureomarginata’, the goldern Irish Yew. 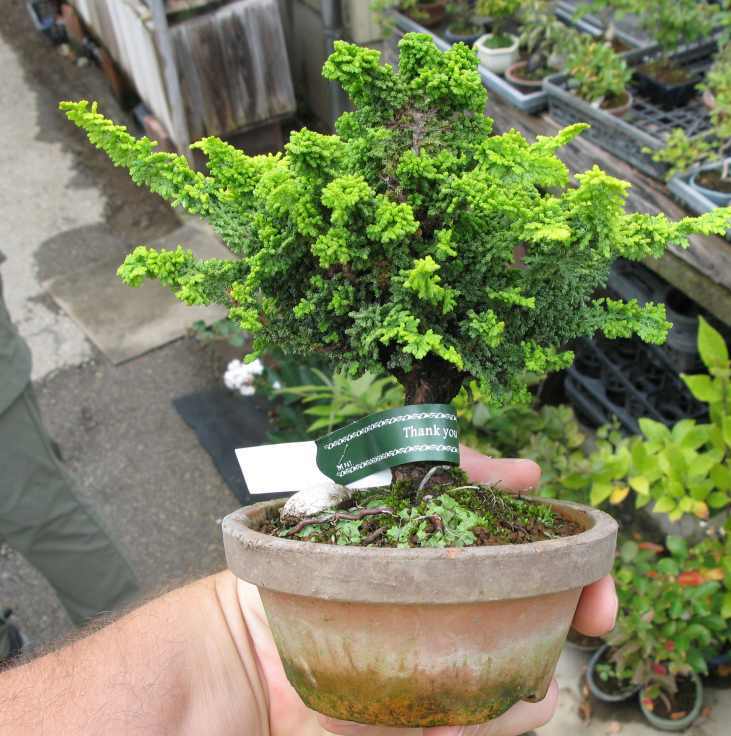 It can be very hard to create into Bonsai because of its upward pointing branches. You will need to wire down constantly and, the yellowish rim to the leaves gives a sickly chloritic appearence to the design. N.B; As many of you will know the Yew family is poisonous so take care with children etc. when pruning. One of the biggest considerations when it comes to pruning Yew trees is their apical dominance. You should regulate this by pruning strongly around the top to prevent the top branches swelling out of proportion to the trunk and by making the energy go to the basal branches, which will intern promote more swelling around the base of the trunk. This can be sped up by growing sacrifical branches as well. The species will also bud readily on old wood around existing nodes when vigorous and healthy, which can be very benefical when working upon old collected trees. Due to this readiness in budding they are very forgiving to poor pruning, but I will try to explain the correct pruning regimes to stop die back and damage to the tree. In the spring time the trees buds will burst into life producing light green shoots of growth, which should be allowed to extend to about 3-4 cm before pinching. This task is done by using the finger and thumb (not the nail) by supporting with one hand the base of the new shoot while plucking in half with the other. Now if the desired length of the pad has already been achieved it is possible to completely remove the new growth tip shoots to make the tree back bud in the inner of the foliage pad providing the tree is healthy. This procedure can be carried out as the tree puts on its growth extensions, but if you leave the growth over a period without pinching, the shoots will harden off and become impossible to pinch, so you will have to prune with scissors. As this tree is so vigorous, when structuring your pad you will need to remove opposing side shoots usually the growth extensions on the inside of the branch curves. While the tree is in full active growth (May- beginning of August) it is possible to prune back with sharp scissors anywhere along the foliage shoot providing you leave some foliage as a sap drawer after you’ve pruned. To minimalise damage to the leaves you should cut at a 45° angle to the shoot with scissors so you can prune between the foliage. Autumn and winter pruning is possible on this species, but you must cut back to a secondary back shoot, so the energy going up the stem will just be diverted into another growth tip. During the summer period it is advisable to thin out the dense canopy of refined specimen trees to allow light into the basal branches. You should do this by plucking the leaves off around the junctions within the branch structure and removing downward pointing leaves within the foliage pads. Re-potting should be done just before active growth, so this would vary greatly in Britain according to our changeable weather. In the sunny South of England, where I am, they usually come into growth around April depending on where you are keeping the tree e.g. greenhouse etc., so I usually start around the beginning of April. The Yew tree has very fleshy roots so you have to be a little gentle when teasing out the roots with a root rake not to damage too much. I find a gentle hosing of water can sometimes help get into very stagnant existing soil mixes, especially with collected material. This species should not be root pruned too hard because their spring burst of growth will not be able to sustain excessive root pruning, but remember to prune to achieve a good radial root growth, for example, leaving the weaker area and only prune the dominant area of root. If you are re-potting out of doors you should be careful of drying winds affecting the fleshy root ball. You can stop this by misting regularly with water until it is transplanted and watered in. The best soil mix I have found for this species is 80% sifted from dust and graded 3-4mm Akadama soil – the hard double red line grade, 15% 3-4mm Cornish grit to enhance drainage and to stop the Akadama clay from breaking down and 5% Sphagnum Moss, cut up and sifted through a coarse sieve. At the moment I have found the live New Zealand Moss, that they sometimes sell for hanging baskets, to be very good. The Yew tree has very fleshy roots so you will need to frost protect in the winter, but a lot of the problem can occur from too much water retention within the soil with poor draining cold soil mixes. It will be more important to protect these trees until you can change the soil medium. Due to this species having a very fleshy root I have found the growth habit to be not so good grown in a plastic Bonsai pot, because the trees root ball can not breathe through the plastic wall lining.